Please follow the guide below to upgrade WC Autoship 4.0 or higher to Autoship Cloud. Any WC Autoship versions less than 4.0 cannot be migrated directly to Autoship Cloud. Please contact support for help migrating versions of WC Autoship 3.x or less. Please follow these steps carefully to manage the upgrade process easily and responsibly. Though similar, Autoship Cloud is a fundamentally different solution than WC Autoship. If you are planning to upgrade from WC Autoship to Autoship Cloud, you should first test the integration with Autoship Cloud on a staging or test site. Important: deactivating the WC Autoship plugin will help to ensure that no automated processing of Autoship Schedules occurs on your staging site. Navigate to the Plugins page in the Wordpress Admin section of your site. De-activate WC Autoship and all plugins related to WC Autoship (for example, WC Autoship Authorize.net Payments). Note: You should only de-activate, not delete. Autoship Cloud requires the following official WooCommerce extensions to accept payments. This will replace any WC Autoship payment plugins on the site. The payment plugins for WC Autoship will not work with Autoship Cloud. The most popular payment plugins are listed below. Contact us if you do not see your payment gateway listed. Once you've determined that you are ready to upgrade from WC Autoship to Autoship Cloud, we strongly suggest trying the upgrade process on your staging site. This is especially important for live production websites. Placing your site into maintenance mode is an easy way to avoid issues while upgrading Autoship on your site. We've found that using the plugin WP Maintenance Mode is a simple way to perform this on Wordpress sites and have a simple guide for using this plugin properly during an upgrade. Upgrading Wordpress software & plugins can be unpredictable. Plugin and theme conflicts are known to occur in Wordpress environments. It is important to create a restore point so that the site and database can be reverted in the case of an error with the upgrade. Navigate to Autoship Cloud > Migrations in the Wordpress Admin section of your site. Click the button to "Import WC Autoship Schedules". This action will copy the existing WC Autoship Schedules on the site and create corresponding Scheduled Orders in the format for Autoship Cloud. IMPORTANT: Do not navigate away from the page while the import is running. This will disrupt the import from running. Please wait for the import to complete before performing another import or action on the page. Click the button to "Import WC Autoship Product Settings". This action will copy the existing WC Autoship product settings into the format for Autoship Cloud, such as Autoship Recurring Price. 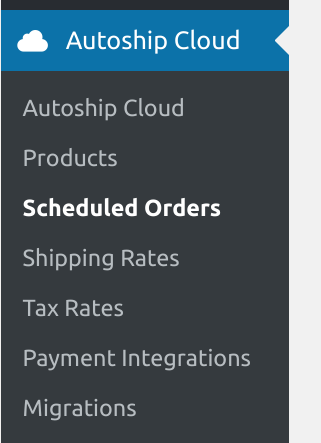 Navigate to Autoship Cloud > Scheduled Orders. This list will show the Scheduled Orders which have been migrated from WC Autoship. Confirm that the WC Autoship Schedules from your site have been migrated successfully. Navigate to the Plugins page in the Wordpress Admin section of your site. Delete WC Autoship and all plugins related to WC Autoship (for example, WC Autoship Authorize.net Payments). These plugins are no longer needed. Congratulations, you have upgraded to Autoship Cloud! Edit a WooCommerce Product enabled for Autoship. For example, you can now edit Autoship Checkout Price, Autoship Recurring Price and set unique Frequency Options per product and per variation. Complete a Checkout with at least 1 product scheduled for Autoship as a new customer. Once you are satisfied with the migration, you can disable or remove maintenance mode from your site so that it is accessible to visitors and customers again. If you're not satisfied with the migration, you should restore your backup before disabling or removing maintenance mode so that your site is reverted back to a working state. Please get in touch with us about any issues or concerns that occurred during the upgrade process! Once you are satisfied with the new features, repeat all of the steps above on your production site.